Mária Szívós as chairman of the counsel of Metropolitan Tribunal, later as member of the Constitutional Court was playing roles in BKV-case. She decided the pre-trial detention of the accused on precarious causes and their automatic prolongation. Thanks to her decisions many accused were subjected to unacceptable conditions during the detentions. As Constitutional Judge by her separate opinions she pulled back the execution of the right to a lawful judge. Szívós ordered further coercive measures against three ex-colleague of Hagyó. She overruled the prohibition displacements to home guard in case of Miklós Regőczi, Éva Horváth and Ottó Lelovics, without real justification. (source: Winners of BKV-case: Mária Szívós Constitutional Judge – Hagyó dossier blog, 27.08.2012) Miklós Regőczi former BKV deputy-general manager was taken to custody in 3rd February 2010 simultaneously with Enrő Mesterházy advisor to the Metropolitan and Tibor Zelenák head of communication department of BKV. Mesterházy took confession on that day and raised claim against the accusations. The Metropolitan Prosecutor’s Office however initiated the pre-trial arrest of all of them on the basis of escape, hiding and making the evidencing proceeding difficult. Mesterházy and Zelenák were taken to pre-trial detention. Regőczi was taken to home guard. 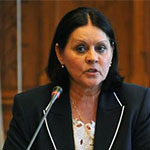 (source: Mesterházy and Zelenák in pre-trial detention, Regőczi in home guard – Index, 05.02.2010) However Mária Szívós put him also to pre-trial detention when he neglected to take incriminating confession against his principals on 3rd February 2010. She did this independently from the fact that there was no evidence for the danger of escape. (source: Miklós Regőczi accused of VIII rank confessed in Kecskemét Tribunal on 6th November 2012 – official website of Miklós Hagyó) The Central District Court of Buda ordered home guard – instead of pre-trial detention – against Ottó Lelovics communication associate of Hagyó, with the reason that there is no danger of escape on his side. Despite of this, Mária Szívós overruled the home guard decision and ordered the most rigorous coercive measure; (source: Decision 30.Bnf.1355/2010/2. of the Metropolitan Court as second instance overrules the decision 15.Bny.1017/2010/2. of the Central District Court of Buda – official website of Miklós Hagyó) and then she prolonged it. (source: Decision 30.Bnf.2833/2010/2. of the Metropolitan Tribunal confirms the decision 3.Bny.44717/2010/2. of the Central District Court of Pest and prolongs the pre-trial detention of O.L. until the 26th November 2010 – official website of Miklós Hagyó) Lelovics spent 6 months in jail. After this, Szívós ordered the prolongation of his home guard. (source: Decision 30.Bnf.3311/2010/2 of the Metropolitan Tribunal as second instance in which confirms the decision 1.Bny.46723/2010/2 of the Central County Court of Pest and so prolongs the pre-trial detention of O.L. until 24th December 2010 – official website of Miklós Hagyó) She also changed the home guard against Éva Horváth former press-officer to pre-trial detention without reasoning (source: Decision 30.Bnf.1355/2010/2. of the Metropolitan Tribunal as second instance in which overrules and modify the decision 15.Bny.1017/2010/2 of the Central County Court of Buda – official website of Miklós Hagyó). However the judge admitted that there was no evidence proving at least the intention to hide, escape or terminate evidences but she believed that it may happen in the future. (source: Observations on the confession of Éva Mátray-Horváth VI rank accused on 22nd January 2013 at Kecskemét Tribunal – official website of Miklós Hagyó) Trash spilled into the center of her cell mixed into her personal stuff and with a “Clean it Jewish!” call they disgraced her. She was told that if the rabbi comes again they will be unable to protect him against “beating himself”. On top of this the doctors of the prison were trying to drug her by injecting Rivotril into her without her knowledge or consent. Due to her statement it was not rare that she had to suffer in 54 C hot in the 6sqm cell with 4 inmates and the only gap through which some fresh air could have entered was closed. She was taken to the interrogations fully cuffed like murderers – by which they caused severe and incurable injuries. When she raised claim against this treatment at the warder he replied that “shut up or I consider your behavior as hostile and I may shoot you”(source: BKV-trial: “Clean Jewish” – Népszava online, 17.01.2013) Nothing from the above humiliation would have been performed if Mária Szívós had not order the pre-trial detention without any reason.